We've *officially* seen it all. 2017 is already looking promising because now, long-distance lovebirds won’t have to go days/months/weeks without physical intimacy… sort of. 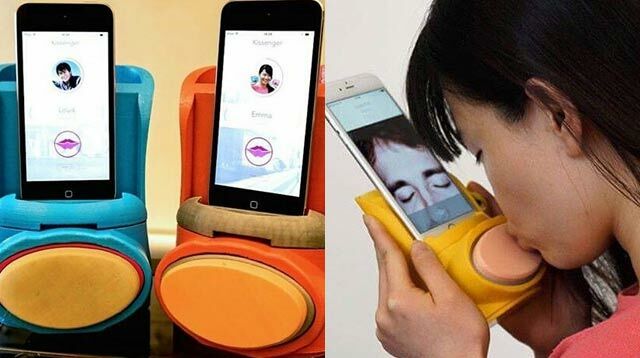 Thanks to technology, we finally have the "world’s first mobile kiss messenger" called Kissenger. Researchers at the Imagineering Lab at City University London said, "Kissenger can sense your kiss and transmit realistic kissing sensations to your partner in real time. You can also feel the force on your lips when your partner kisses you back." That’s right—it goes both ways! Right now, only iPhone owners can download the app. Also, sorry iPhone 7 users, but the silicone lips need to be plugged into the headphones’ jack so it looks like you’ll have to wait a little longer for some sugar.